Tired of switching between Gmail accounts? Get Shift. Shift is the email client that makes navigating between Mail, Calendar, Drive + all of your favorite apps easy. Raise your hand if you have ever thought of answering emails as a chore. Alright, alright...we can’t see you right now (that would be creepy), but we will assume that hand is up. While email is an amazing tool, it can also be a pain in the you-know-what, especially when you’ve got them coming at you left, right and centre, and often from multiple accounts. We’re here to help you increase your productivity. 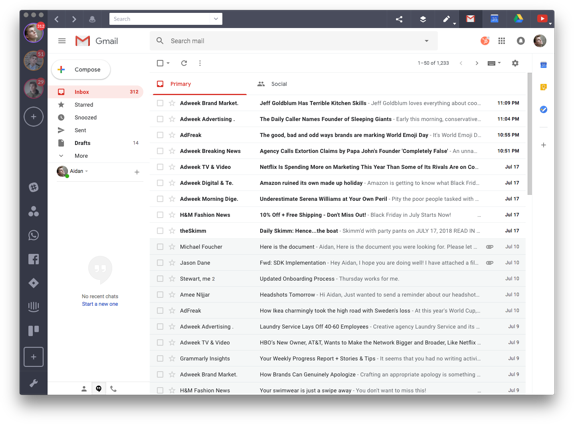 In this post, we’re taking a deeper dive into ways you can take a load off with Shift and get more sh*t done on your desktop Gmail. Have you ever had a bunch of emails you felt you were responding to with cutting and pasting the message? Well, now you don’t have to. The Canned Responses feature allows you to create and save responses that you can quickly us. This is great for answering generic emails or frequently asked questions. Because these responses will be generic, make sure that you take the time to proofread every time before you send. A wrong contact name or company name could look bad. More often than not, you are given tasks to do or reminders to finish something via email. With the help of labels, you can turn your inbox into a better task manager. 1. From your inbox, create a new label and name it "To do"
3. These should be nested under "To do" and named "Today," "This week," and "Later." Now, whenever you receive a new email, label it accordingly. Also, adding in a colour code to your labels will allow you to prioritize at a glance. You can also use labels to assign emails to certain projects or teams to help organize your inbox. This trick will help you get more organized and stay organized. 2. Under General, find "Keyboard shortcuts"
We all have those scary moments where we realized that we misspelt someone's name or forgot to include information or even accidentally hit send mid-composition. Instead of sending that awkward recovery email, just enable the undo-save feature. This allows you to create a time buffer between you clicking the send button and the email actually getting sent out. 2. Scroll to find "Undo Send:"